This fascinating hand colored 1814 map by Edinburgh cartographer John Thomson depicts southern India. Covers from Bombay in the North to the northern part of Ceylon or Sir Lanka. Map is color coded according to the figures that dominated each region. British controlled areas are red, the territory of Nabob of Oude is orange, the Berar Rajah is green, the regions controlled by the King of Candy are brown, etc. Overall a spectacularly highly detailed map of this fascinating region. 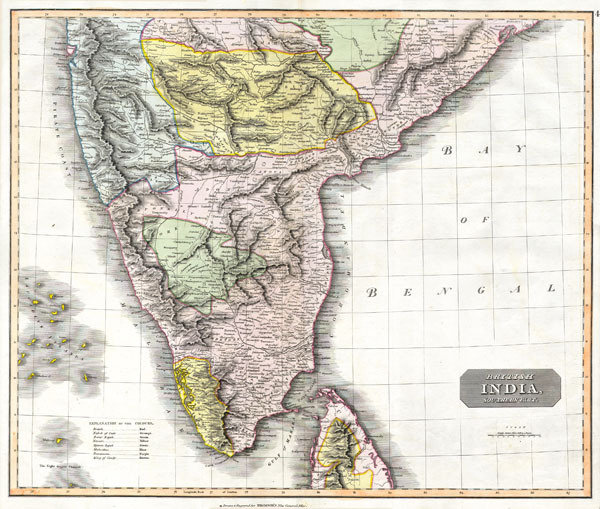 One of the finest maps of India to appear in the 19th century.